New class with Brit + Co! Remember the video I posted of spending 36 hours in San Francisco? Well, it was for Brit + Co and now the class is available! It's called Modern Scrapbooking and would be great for both beginners and people who have been papercrafting for years. I had so much fun putting together this mini book of memories. We designed it to be a year in review if you wanted to highlight one photo from each month (I know, it's hard to narrow down, which is why you can choose to do it however you want). Giving thought to just one photo that was the highlight of the month helped me reflect and really appreciate how wonderful life is. It was really fun to finish a book with a year full of fun memories in just one afternoon too. There is also a kit that goes along with the class, so if you want to follow along with the same supplies I used, you're able to. It's available in limited supplies though, so be sure to grab it while you can! For all the details for joining the workshop, go to the sign up page where there is also a little video. If you have any questions, please leave them below! Thanks, as always! Well, I think it goes without saying, but I did not tidy up the studio before snapping this photo. I think many people would assume this looks like total chaos and isn't very organized at all. But in my world, it is in fact a bit chaotic yet also organized. I know where (most) things are and what projects need immediate attention and what's next in the pipeline. I've come to the realization that I actually thrive in an environment that looks like this most of the time. Sure, between projects I straighten up and clean off surfaces just to mess them up again, but it's what works. And has been working for quite some time. And thanks to this interesting article, I'm no longer feeling so guilty about the fact that my workspace isn't exactly Pinterest worthy. Whatever works, right? PS - I'll be broadcasting from my studio for Inspiration Live on Saturday, November 1st. The class is just $20 and you'll have forever access to the materials. I mentioned it a couple weeks ago in this post. It will be a full day of Big Picture Classes FUN from the convenience of your computer or mobile device. The talented and inspiring Stacy Julian will be kicking it all off at 9am PST. My live video chat begins at 11:30am PST and I'll be sharing all kinds of things that are in the works in addition to projects made exclusively for this class. You can still participate even if you aren't available on Saturday, November 1st. All content, videos and chat transcripts will be archived so you can take in at your convenience. This event is a perfect way to connect, create and be productive with me, Kelly Purkey and products we've designed and directed. You can purchase Inspired Pages and A Mini kit full of exclusive product from Studio Calico. If you missed our 4Experts workshop Here & There Inspiration this is your chance to experience a one-day, super-fun version of what we taught there. Or if you wanted to sign up for Here & There Inspiration, you'll get this as a bonus and can treat the 12-week workshop as a self-paced class! A full day of BPC FUN from the convenience of your computer or mobile device. Hope you'll join in on the fun for Inspiration Live! As much as we love when people drop by, the number of knocks on our doors from uninvited people has been pretty high lately. It happens at random times throughout the day, but seems to be when Jack is napping. My desire to open the door for a stranger who may have just woken up my child is at an all time low, and the dogs going crazy doesn't help the situation either. I searched Ace and Home Depot and the simple signs they had just didn't cut it. I decided to make my own and share it with you. First, I designed a cut file in Silhouette Studio and formatted it to my liking. Next, I loaded a roll of white vinyl into my Silhouette, adjusted the cut settings accordingly, and let the machine work it's magic. Once the design was cut out, I peeled off the layer of vinyl around my design. From there, I took my roll of transfer paper, peeled it apart, and placed the gridded portion over the design. Using the scraper tool, I smoothed the transfer paper over the design as best as I could. After cleaning the window, I carefully pulled off the sticker paper backing and placed the transfer paper where I wanted it to go. We were laughing at my stance as I was trying to make sure it was completely straight. Using the scraper tool, I rubbed the stickers onto the window as I slowly peeled back the transfer paper. So happy with the finished product! Simple, to the point, and polite. Just a friendly reminder that my newest online class, Here & There Inspiration with tons of tutorials and paper projects starts tomorrow! In case you missed the new promo video, check it out here. Recently I had the pleasure of teaching at a huge store called Hannah's Home Accents in Antioch, IL. It's always so neat connecting and creating with such awesome people. Thanks for having me, Dana! And thanks to everyone who joined in as well. You all are awesome and inspired me to sign stuff using watercolors! I'll be making a quick trip up to Berkeley on July 11th (the class sold out in less than 24 hours!) and then take a little break for in person classes until the fall. If there are any leftover kits, I will be sure to blog about it and make them available. 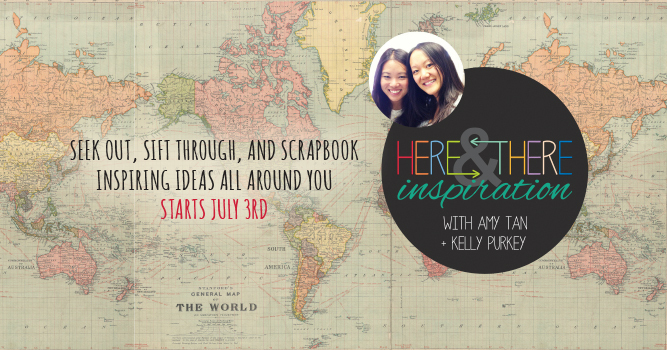 Remember, from anywhere around the world, you can still join me for Here & There Inspiration which begins on July 3! Thrilled to share that my latest online class, Here & There Inspiration is open for registration! It's something Kelly Purkey and I have spent countless hours on since the beginning of the year. There will be weekly videos from the both of us, along with plenty of step-by-step instructions and tips to help you seek out, sift through, and scrapbook the inspiring ideas all around you. It's part of the 4Experts Series at Big Picture Classes, and we can't wait to have you join us! For all the details, check out Here & There Inspiration on BPC.